$400 crude? Unlikely. End of lithe petrodollar? Yup. Year of the takeover moves into the military sector… gold jumps again… reader suggests we offer The 5 as a stand-alone paid publication… and more! “My prediction is that we’re going to see quite a few wild swings (both higher and lower) over the next few months,” says our income specialist Zach Scheidt. After an ugly Wednesday and Thursday, and a Friday that barely began to make up for those losses, the major U.S. stock indexes are back in the red as a new week begins. The Dow is holding up the best, down a third of a percent at 25,260. The Nasdaq is weakest, off more than 1% and just above the 7,400 level. Not helping matters: The September retail figure out this morning laid an egg. The “expert consensus” among dozens of economists polled by Bloomberg called for a jump of 0.6%. Even the most pessimistic guess was for a 0.3% increase. In reality, the increase was only 0.1%. Even if you factor out auto sales (because they’re volatile from month to month) and gasoline sales (because the rise and fall of gas prices can make the overall figure look misleading)… the number was still a huge disappointment — pancake-flat versus expectations of 0.4% growth. Numbers like that are sure to put a hurt on the third-quarter GDP figure due at the end of this month. “Wild swings” are what Zach lives for. Ditto for many of his premium subscribers who are hip to the opening of a “double your income” window. So why does Zach welcome a seemingly “bad” event like this? It all comes back to the “perpetual income strategy” he’s evangelized about for years now. “Every time the market becomes a little more volatile, we get to collect a bigger income payment,” Zach explains. 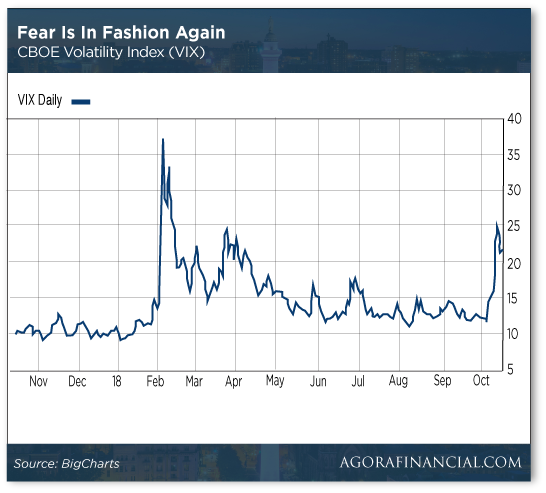 “Because our perpetual income strategy thrives on volatility and pulls even more cash out of the market during these periods. While the market was quiet over the summer, Zach’s recommendations were netting readers instant payouts in the range of $340–380. That’s nice. But turn the clock back to the volatility spike earlier this year… and the payouts were on the order of $480… $540… even $600. Yes, the strategy involves selling options. But it’s nowhere near as intimidating as you might think. Our publisher Joe Schriefer’s been doing it in his own account for years. And he’s such a believer, he recruited grade-school kids to demonstrate how easy it is. See for yourself at this link. This time it’s in the defense sector — a merger between L3 (LLL) and Harris Corp. (HRS). The combined company will be worth about $37 billion — not enough to vault it into the sector’s “Big Five” companies like Raytheon and Lockheed Martin — but the news is giving a lift to defense stocks in general today. As we anticipated, Sears filed early this morning for Chapter 11 bankruptcy. The chain will close about 150 of its 700 stores by year-end. As with other down-and-out retailers, the story was partly about online competition… but mostly about ownership that larded down the firm with debt. Gold is powering ahead to levels last seen in midsummer. On top of the big gain registered Thursday, the bid is up another $10 today to $1,227. Crude is up slightly to $71.56… and we’re not impressed by the $400 threat coming from Saudi Arabia. Donald Trump has sent Secretary of State Mike Pompeo to Riyadh for the proverbial “urgent talks” in light of the disappearance of Saudi Arabian journalist Jamal Khashoggi. Over the weekend, the president threatened Saudi Arabia with “severe punishment” if it turns out the regime killed and dismembered Khashoggi inside the Saudi consulate in Istanbul, Turkey. In a headline-grabbing unofficial response from the kingdom, the chief of the Saudi-owned Al Arabiya news channel has posted an Op-Ed on his network’s website. Whatever. If a 1973-style Arab oil boycott is in the offing, the resulting jump in oil prices will only make it economic for American firms to exploit shale deposits that aren’t economic now… and prices will climb back down, if not necessarily to present levels. But while a boycott is an empty threat… pricing crude in yuan instead of dollars is not. For whatever reason, that part of Aldakhil’s opinion piece was overlooked in the most-popular “$400 Oil!” stories. All true. The “petrodollar” arrangement emerged after the 1973 boycott, the brainchild of Secretary of State Henry Kissinger. Under this system, Saudi Arabia prices oil in U.S. dollars and uses its clout to get other OPEC nations to do the same. In return, the U.S. government protects Saudi Arabia and its allies against foreign invaders and domestic rebellions. As long ago as 2013, we’ve been seeing signs that this arrangement is slowly coming apart. By last year, the Chinese launched an oil futures contract priced in yuan. Meanwhile, we’re starting to see early affirmation of our thesis that the Trump administration isn’t seeking a “better deal” with China… but rather constant confrontation. And there’s growing evidence Big Business is slowly signing on to the agenda. “There is a souring on China across Washington, even in groups that have long promoted stronger U.S.-China relations,” the story says — pointing toward complaints by the U.S. Chamber of Commerce about Beijing’s theft of “intellectual property” from U.S. businesses. The story reminds us Trump’s ambassador to China is former Iowa Gov. Terry Branstad. He’s been an advocate of engagement with Beijing, not least because of his state’s massive grain exports to China. The article doesn’t say so… but if Branstad is cashiered in some sort of administration shake-up… that’s a sure sign the constant-confrontation policy is on. And deepening. On the road to greater marijuana legalization, there are bound to be setbacks… and this is one of them. In August we told you how Wells Fargo shut down the campaign account of a candidate for statewide office in Florida because she takes donations from players in the cannabis industry. Near as we could tell, it was a first. But it also wasn’t a surprise, given how cannabis remains illegal on the federal level and banks are federally regulated. Since then, candidate Nikki Fried won the Democrats’ nomination for agriculture commissioner. But another bank, BB&T, has denied her campaign banking services. Understand, we take no sides in the contest for Florida agriculture commissioner. But the more headlines Fried makes for her medical-marijuana advocacy… the more likely it is Congress will move to finally clear up any ambiguity about cannabusiness’ access to banks. “Your correspondent Friday made a point of how tariffs and taxes are different,” begins a new week’s mailbag. “I would add to your response that beyond limiting the choices of items you purchase (no U.S. alternative), there is also a cost impact on other substitute goods. “Suppose I produce a widget here in the U.S. that is also produced in China. I have to keep my prices competitive with the imports or compete on quality. However, if the imported item goes up 25%, that lessens the pricing pressure on me. I will raise my price as much as I can to stay competitive and may even make additional profit. “The end result is higher cost to the U.S. consumer even if he deliberately ‘buys American’ (my product). I would at least call that an indirect tax. Besides, the feds are pocketing more money through both the tariffs and taxes on my higher profit. “Piggybacking the other readers’ comments last week, why can’t we just purchase The 5 Min. Forecast directly as a subscription itself? “I like The 5 and look forward to reading it every day. Meanwhile, the premium service that I signed up for not only cost a solid chunk of change but following the advice given in that service has also cost my brokerage account just as much if not more than the service itself. “I know, I know. Trading involves risk, blah, blah, blah. “My point is I find value in The 5 Min. Forecast and would rather pay for that than pay for a premium service that’s not only not bringing me any value but actually costing me value. The 5: Well, thank you… but you don’t have to spend $2,000 on a premium service to get The 5. Any one of our entry-level newsletters — of which I count 10 now! — also gets you access. At a typical price of $49 a year, that’s a steal, no? P.S. A developing story in pharma has just come to our attention… and it’s a stunner. It has to do with a fellow Forbes once called “the luckiest guy in the drug business”… but this is a story flying way under the mainstream’s radar. It could add as much as $550,186 to your retirement… starting as early as 16 days from now. Curious? Click here for the latest.